Well, lately we’ve all been feeling a chill in the air. Nothing like changing seasons to inspire us to take photos of our changing landscape. This is especially true since it’s the first fall and winter we’ve lived in our new house, so every new season brings a new view that we just can’t wait to share with you. Remember back when the leaves were changing colors and starting to fall from the trees? We do. 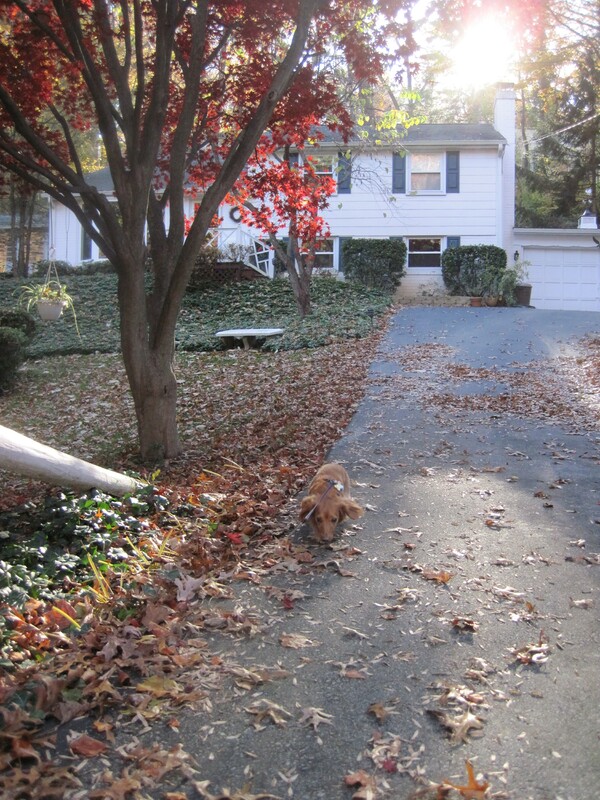 Krister also has still-fresh memories of blowing those millions of leaves off of our roof and lawn for town pickup. Before the town came to collect our leaves, we took a few photographs of the scenery. 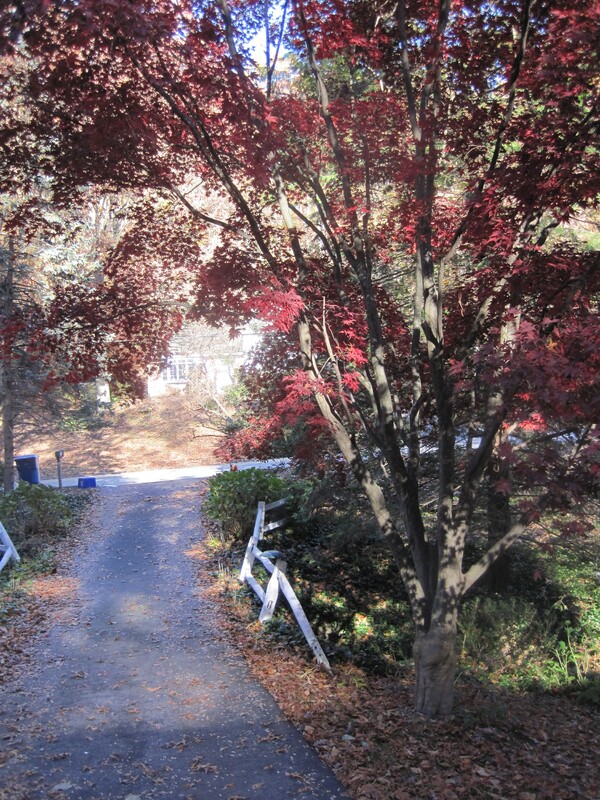 And from the end of our driveway looking towards the spring (and neighbor’s house). 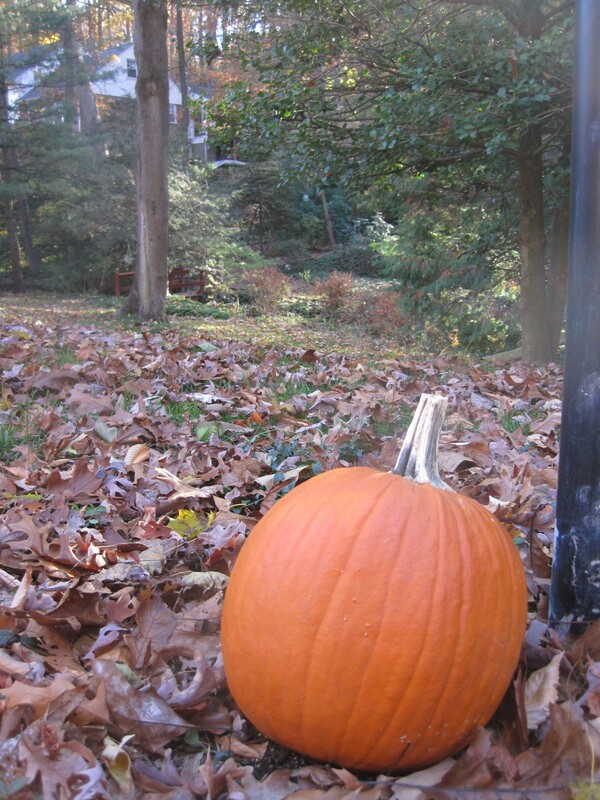 That’s right, Kristin got a little festive, despite being 8 months pregnant, and put out a pumpkin. 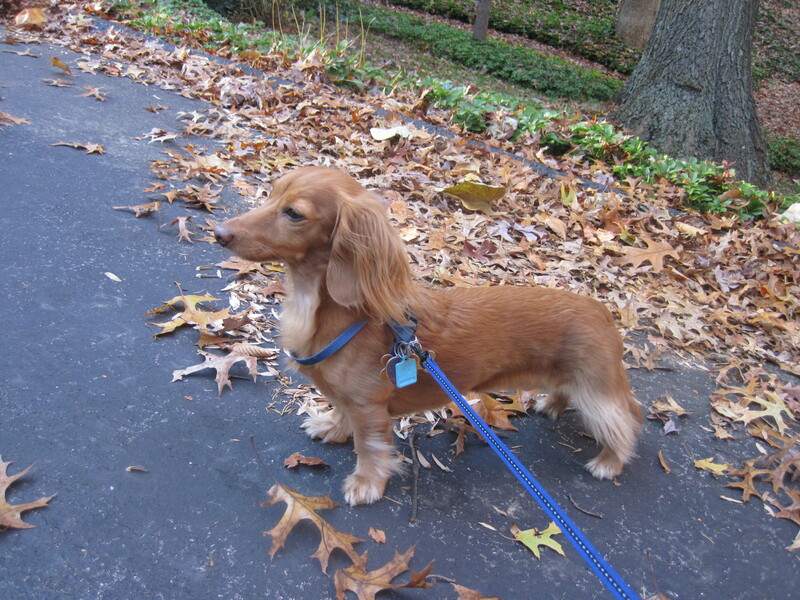 And no slideshow of the fall is complete without a photo of Gigi on high alert. Autumn is definitely Gigi’s favorite season: the squirrels are out, the breeze carries fresh smells, and leaves are perfect for, well, spreading her scent. In May, Kristin promised Krister she wouldn’t decorate for Christmas this year. After all, the baby is due on December 20th, and decorating would be too much effort. Krister knew immediately that Kristin would never keep this promise and that taking the decorations down would fall entirely on him with a newborn around. You can barely see (if you know what you’re looking for) two small Christmas trees in the background covered in multi-colored LED lights. We both agree that a well-decorated yard needs to balance white and multi-colored lights. We also agree that the multi-colored LED lights are awesome. The color is much more vivid than in the lights you probably used growing up. 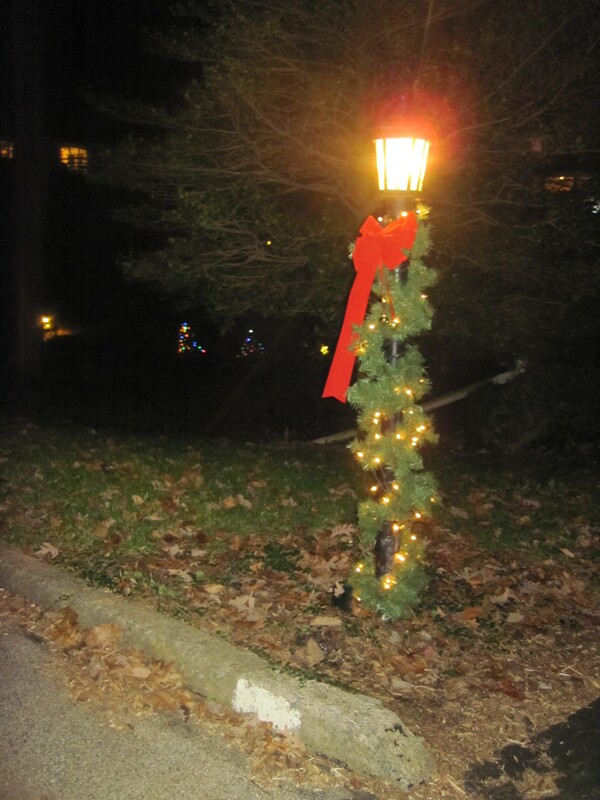 We are still reserving judgment on the white LED lights — the color is more blue (and resembles ice and snow more than the traditional yellow-white lights), but the blue glow of the LED does not match well with the yellow-white of the pre-lit garland on our lamp post. 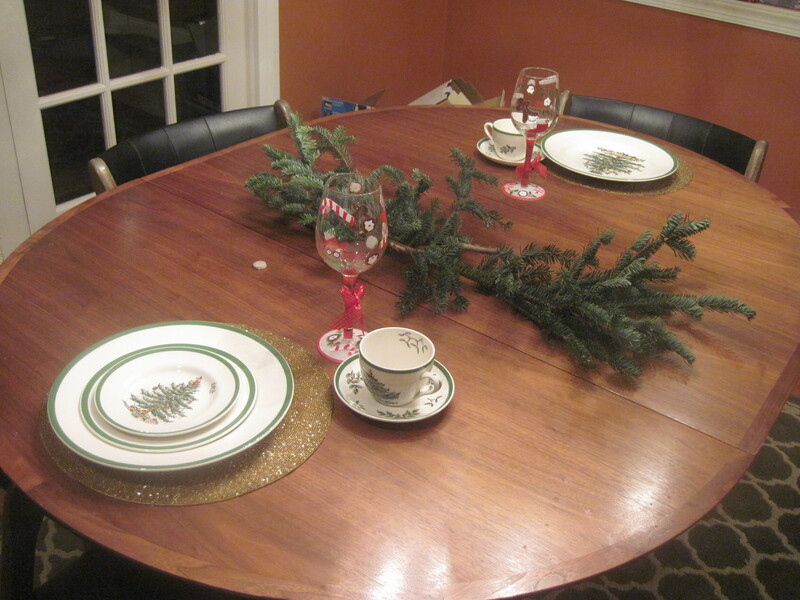 We also decorated our kitchen table with our Spode dishware (thank you to Ken & Priscilla! ), two hand-painted wine glasses (thank you Cathy & Angelo! ), and a few branches we snipped off our Christmas tree to help it fit our tree stand a little better. Naturally, we also had to get a Christmas tree. We agreed that, despite Kristin’s failure to keep to her no-decorating promise, we should only put up minimal decorations. That is really only apparent in the tiny little Chrsitmas tree we got. Even in the stand, it only stands about 4 feet tall. Still, it easily holds all of our ornaments and was priced to sell from Home Depot. 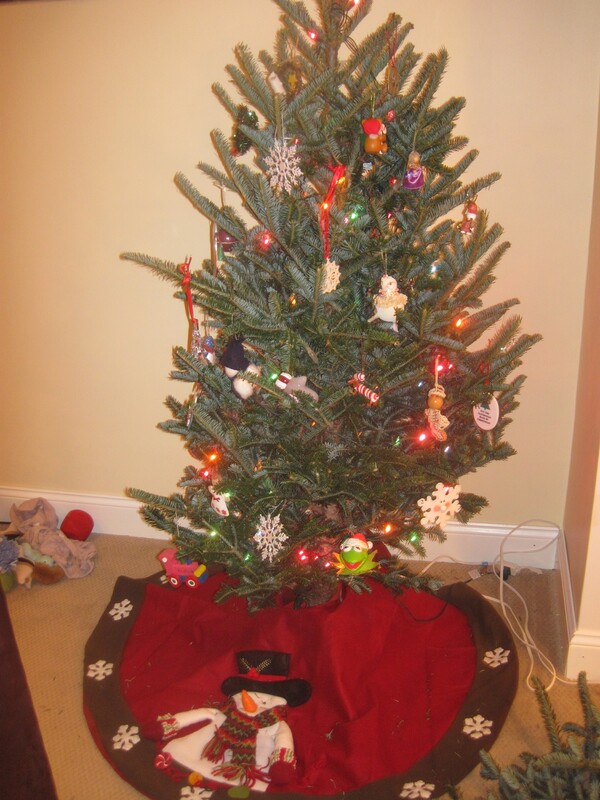 We also picked up a new tree skirt at HD, since our old one was not holding up. The only problem with the new one is that the adorable snowman at the bottom resembles a dog toy. The dogs may attack our new tree skirt before the end of the season. 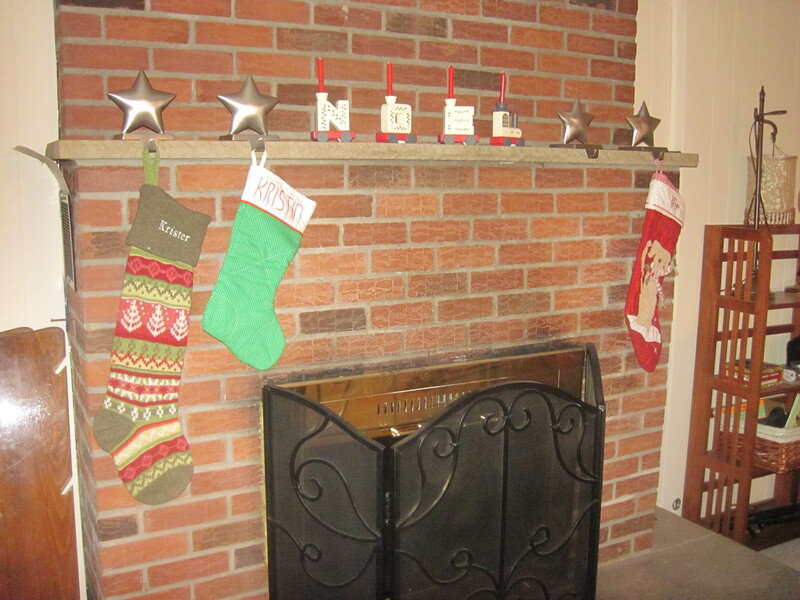 And the last decorations are in the basement along our fireplace. Krister and Gigi got new stockings this year. You’ll notice an extra stocking hook next to Gigi’s on the right – that’s where our baby-to-be will hang his stocking! Big thank you to Prudence for helping us set up our Christmas decorations this year. You were a huge help!